[S917] GRO Scotland, marriage record, Parish of Beath, Statutory Marriages, GRO 410/00 0021. [S430] Census - 31 Mar 1901, UK census, Scottish GRO 410/00 001/00 006. [S612] GRO Scotland, birth/bapt record, Parish of Beath, Statutory Births, GRO 410/172. [S800] National Archives - NZ Archives (Archway), Passenger Lists, 1839-1973, Tongariro, image page 1, 4, 5 and manifest, available at FamilySearch (https://familysearch.org/), FHL 4415931. [S542] Index - New Zealand BDMs online, at http://www.bdmhistoricalrecords.dia.govt.nz/, Death Reg. No. 1942/24047, aged 70. [S800] National Archives - NZ Archives (Archway), Probate, Westport Court, record WP1003/1943, agency CAIF, series 20704, container C767696, box 84, image 121-133, digital folder 7354136. [S542] Index - New Zealand BDMs online, at http://www.bdmhistoricalrecords.dia.govt.nz/, Death Reg. No. 1957/34766, aged 87. [S800] National Archives - NZ Archives (Archway), Probate, Westport Court, record WP1681/1961, agency CAIF, series 20704, container C767699, box 89, image 242-254, digital folder 7344386. [S972] Buller District Council cemetery database, at http://bullerdc.govt.nz/cemeteries/, Orowaiti cemetery, plot 365, block F, row 366, Presbyterian, aged 86. [S612] GRO Scotland, birth/bapt record, Parish of Kirkcaldy & Abbotshall, Statutory Births, GRO 442/00 0487. [S483] Email - W Bale, email and correspondence to D Ferguson, 17 Dec 2006. [S187] Family Tree - L Marshall, "Thomas Forsaith descendents." [S353] Electronic Files - Pallot's Marriage Index, by Institute of Heraldic and Genealogical Studies. [S581] London Metropolitan Archives, at http://www.ancestry.co.uk, Saint George The Martyr, Register of banns of marriage, P92/GEO, Item 112 and Saint George The Martyr, Register of marriages, P92/GEO, Item 185. [S117] Census - 6 Jun 1841, UK census, ED 14 HO107-708-4 Folio 22 p6. [S118] Census - 30 Mar 1851, UK census, ED 13 HO107-1534 Folio 421 p5 GSU roll 174764. [S363] Newspaper - Sth Australian Register, edition of 2 Oct 1855, Vol XIX, No. 2814, p2, Shipping Intelligence. [S366] CD - Sth Australian Deaths, Sth Aust Index of Deaths 1842-1915, Book 18, p343. 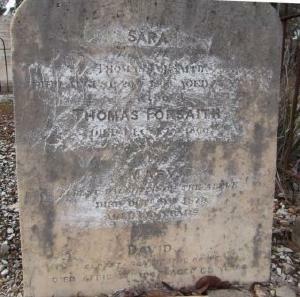 [S775] West Terrace (SA) Cemetery database, at http://www.aca.sa.gov.au, Section: Road 3, path 16E, site 18. This gives a death date of 24 Aug (suspect). [S192] CD - Extracts from Dr Williams Library, British Vital Records CD. [S190] Index - GRO and Office of National Statistics, England & Wales Civil Registration Qtrly Indexes, Birth: District of Shoreditch, Vol 2, p378, 3Q1839, mother's maiden name CAMPIN. [S190] Index - GRO and Office of National Statistics, England & Wales Civil Registration Qtrly Indexes, Birth: District of Shoreditch, Vol2, p485, 1Q1844, mother's maiden name CAMPIN. [S190] Index - GRO and Office of National Statistics, England & Wales Civil Registration Qtrly Indexes, Birth: District of Shoreditch, Vol 2, p485, 2Q1846, mother's maiden name CAMPIN. [S190] Index - GRO and Office of National Statistics, England & Wales Civil Registration Qtrly Indexes, Birth: District of Shoreditch, Vol 2, p456, 2Q1848, mother's maiden name CAMPIN. [S190] Index - GRO and Office of National Statistics, England & Wales Civil Registration Qtrly Indexes, Birth: District of Shoreditch, Vol 2, p463, 3Q1850, mother's maiden name CAMPIN. [S190] Index - GRO and Office of National Statistics, England & Wales Civil Registration Qtrly Indexes, Birth: District of Hackney, Vol 1b, p253, 4Q1852, mother's maiden name CAMPIN. [S928] BDM NSW Registry, marriage record, Reg. No. 6903/1892. [S926] BDM NSW Registry, birth record, Reg. No. 5147/1872. [S926] BDM NSW Registry, birth record, Reg. No. 16264/1897. [S927] BDM NSW Registry, death record, Reg. No. 8449/1939. [S927] BDM NSW Registry, death record, Reg. No. 28087/1942. [S284] Index - New South Wales BDMs online, at http://www.bdm.nsw.gov.au, Birth Reg. No. V1834355 129/1834, son of John M & Jane. [S891] Cemetery Marker - , St Thomas, Nth Sydney, Australia, transciption in Nth Sydney Library, Local History section. [S284] Index - New South Wales BDMs online, at http://www.bdm.nsw.gov.au, Death Reg. No. 12502/1894, St Leonards, son of John and Grace(?). [S220] Family Tree - provided by L Marshall, "Lawry Family tree." [S443] CD - NZ Marriages, CD - NZ Marriages 1836-1956 V2, NZ Registrar General's Folio 7280. [S542] Index - New Zealand BDMs online, at http://www.bdmhistoricalrecords.dia.govt.nz/, Marriage Reg. No. 1922/8538. [S542] Index - New Zealand BDMs online, at http://www.bdmhistoricalrecords.dia.govt.nz/, Death Reg. No. 1949/29310, aged 62. [S542] Index - New Zealand BDMs online, at http://www.bdmhistoricalrecords.dia.govt.nz/, Death Reg. No. 1967/27338, but claimed to be aged 80. [S924] BDM Registrar of New Zealand, marriage record, Reg. No. 1909/7435. [S542] Index - New Zealand BDMs online, at http://www.bdmhistoricalrecords.dia.govt.nz/, Birth Reg. No. 1880/252, to John Godfred Carlquist and Mary Ann. [S923] BDM Registrar of New Zealand, death record, Reg. No. 1926/5831, aged 45. [S727] O'Neills Point Cemetery database, at http://www.northshorecity.govt.nz/Services/OnlineServices/…, Row J, plot 230. [S922] BDM Registrar of New Zealand, birth record, Reg. No. 1909/4160. [S190] Index - GRO and Office of National Statistics, England & Wales Civil Registration Qtrly Indexes, Marriage: District of Chertsey, Vol 2a, p191, 4Q1927. [S1044] Census - 29 Sep 1939, UK Register, RG101/0584F/001/32, Letter Code: AXGI, Schedule 10. Daniel CARPENTER was born circa 1897. (Birth date based on age at death). [S190] Index - GRO and Office of National Statistics, England & Wales Civil Registration Qtrly Indexes, Marriage: District of Bromley, Vol 5b, p532, her name registered as WHYTE. [S355] Email - Mary (Macdonald) Khanna, email to D Ferguson, 3 Feb 2004, Details taken from Ian Macdonald's mother's address book during interview with Ian by Mary Khanna (Macdonald), Jan 2004. [S677] Index - England High Court of Justice, England & Wales National Probate Calendar, probate granted in London to Eirene Alison Hepburn CARPENTER, widow, and Frederick William DURHAM, bank Manager. [S190] Index - GRO and Office of National Statistics, England & Wales Civil Registration Qtrly Indexes, Death: District of Uckfield, Vol 5h, p511, aged 69.